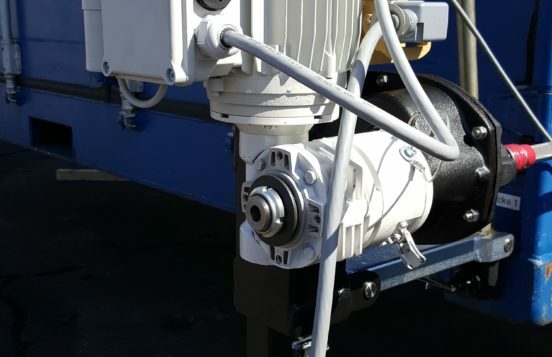 Lifting wheels are placed between heavy-duty roller movement sets and aircraft loading system. 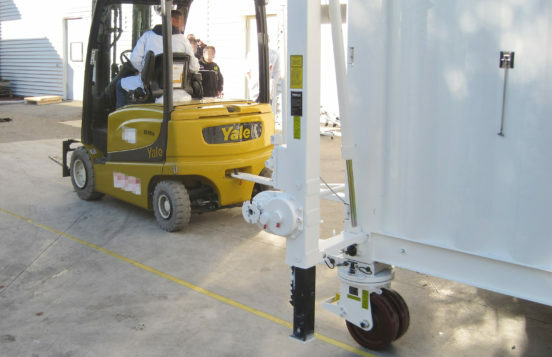 The lifting wheels can be used for moving containers also on less paved and less even ground. The attachment of the lifting wheels may be effected from side into the ISO-corners. 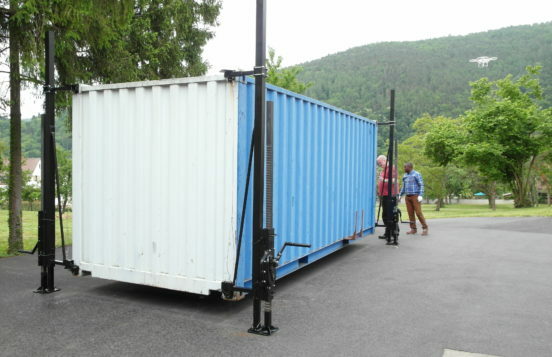 The container can be manoeuvred very easily and be moved by several vehicles. The equipment is also certified for loading containers into Hercules C-130 aircraft. 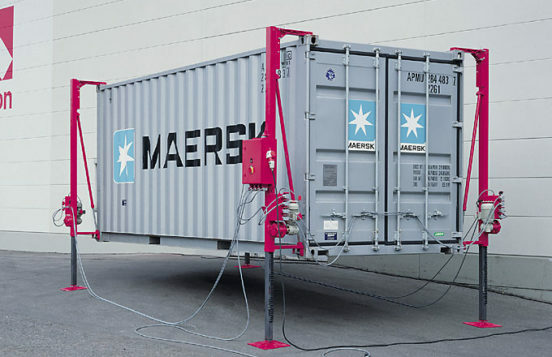 Support device for the intermediate storage of containers on loading height. 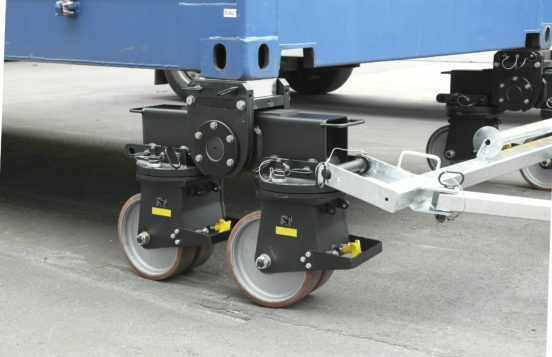 The container roller movement set can be used for manoeuvring containers on paved ground. The attachment of the rollers may be effected from below into the ISO-corners, the side pockets of the ISO-corners remaining free for other purposes. 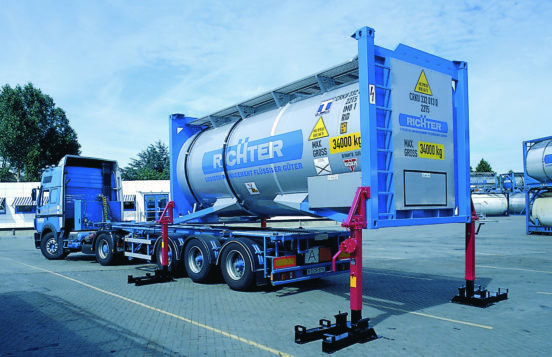 Lifting, rolling and loading systems of type 1350 are suitable for depositing containers and shelters without the help of vehicle cranes and to load them into airplanes or wagon. Traversing hoist ensuring that telephone exchanges, field hospitals, power and water supply units, etc. can be loaded quickly in the event of emergencies and disasters. Lifting devices are suitable for lifting containers off the truck and depositing them on the ground without the help of cranes. Our lifting ystems are modular in design, so that low-cost solutions are available for your specific requirements. A lifting system consists of four lifting supports, with the carrying capacity of an individual lifting support amounting to half of the carrying capacity of the lifting ystems as a whole. Levelling supports for a maximum lifting height of 600 mm and maximum system carrying capacities up to 16 t (dynamic) and 26 t (static). 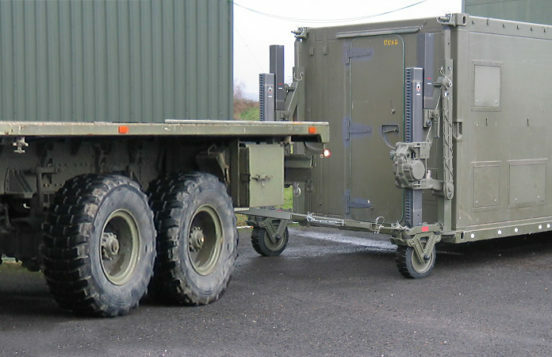 Levelling supports are used on containers which require precise alignment on the ground, so that they can be linked up to form larger functional units (e.g., mobile hospitals, encampments).